*UPDATE* A NY Times article confirms that leading nuke corporations like Exelon are following a strict policy of milking profit out of dying nuke plants near meltdown. 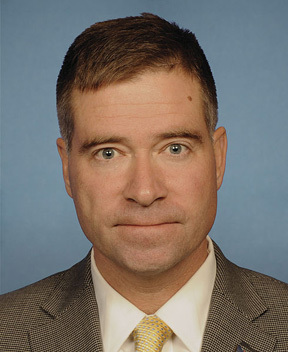 Like most members of his party, freshman Congressman Chris Gibson (NY-20) believes in Big Government and massive public spending. The Republican, newly installed in the gerrymandered district that curls around the City of Albany like the letter C, is loudly calling for at least $10 Billion in federal taxpayer subsidies for a project he wants to locate in his new district. Or, to be more precise, Gibson wants someone to use his district to collect federal money for themselves. But he’s not like the mayor of Albany, angling for penny-ante stuff like a convention center or a discount garbage dump that takes toxic waste. 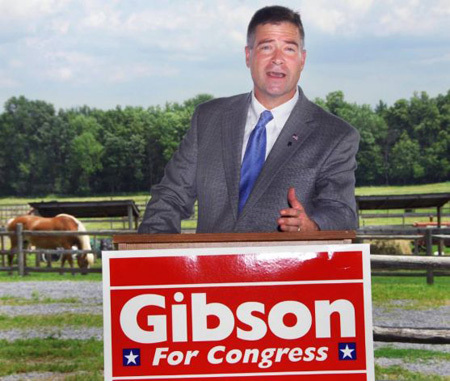 No, Gibson is a congressman now. He’s going for the radioactive gold. Gibson wants some big corporations to build a nuclear power plant in the Washington County town of Easton. The elected officials of Easton are supportive of his idea, it usually doesn’t cost much to persuade small town politicians to sign on to cash funneling schemes. Dumps, prisons, garbage burn plants, nuclear waste storage facilities, it doesn’t matter what as long as some of that incoming money falls in their direction. Here’s the problem. Easton is less than three miles east of Saratoga National Park. Easton is about 12 miles from the City of Saratoga Springs. Easton is about 19 miles from downtown Albany,, which is where I live. If that Big Government nuke money does indeed get funneled through the Town of Easton, you can be sure that Gibson will be standing very close to the falling rain of cash. Very close. After all, taxpayer dollars is what the nuke industry is all about. But what are the chances that such a deadly radioactive time bomb will actually end up being planted 19 miles from our homes in the South End? In a minute I’ll get back to Chris Gibson and his hoped-for trickle down from the nuke corporations. But first a quiz question. Which currently operating public nuclear power generating plant is located closest to our homes in Albany? If you said “Indian Point” then you are wrong. If that’s your answer, then you’ve been listening to the corporate media. That particular well-known ominous threat to the Hudson Valley is 97 miles from Albany, outside the tiny village of Buchanan, across the Hudson River from Bear Mountain State Park. The correct answer, which someday your life may depend on knowing, is the “Vermont Yankee” nuke reactor in Brattleboro, Vermont is the closest public nuke plant to our homes in Albany. That old, overworked, broken down and very leaky pile of contamination is a mere 66 miles from Albany. That’s 31 miles closer than Indian Point. Both are owned by the same holding corporation, which calls itself Entergy. 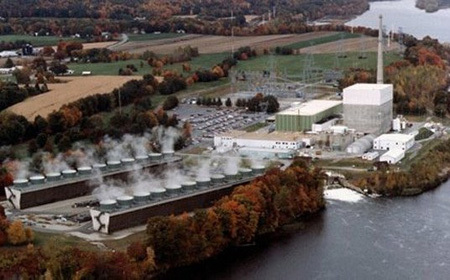 After Vermont Yankee Nuke in Brattleboro melts down - note I did not say “if” I said “after” - then very soon after the disaster the international nuclear regulatory bodies will demand an 80 kilometer evacuation zone around the plant. That’s standard. For example, that’s the size of the dead zone that the Japanese government at last reports is reluctantly extending around Fukushima. This is in response to international pressure... from many nations but not from the United States. 80 kilometers is about 50 miles. When Brattleboro goes up, Boston will be evacuated along with most of Connecticut and New Hampshire and all of Massachusetts. The Vermont Yankee Dead Zone will extend into New York State right up past the village of Easton, the site of Gibson’s proposed nuke plant. This zone of permanent evacuation will extend almost to the Hudson River. Much of Gibson’s Congressional district will be abandoned. Well, the plants at Fukushima are identical to Vermont Yankee... I was a senior vice president of a company that provided services throughout the industry, including Vermont Yankee, and actually provided the nuclear fuel racks that were used in this design. 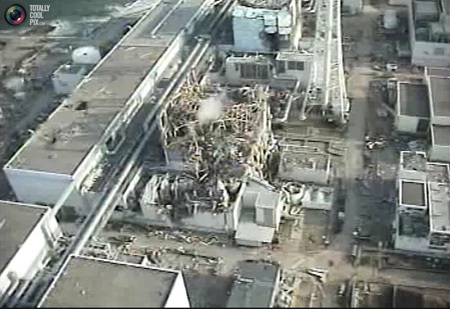 So, that’s one of the problems at Fukushima, is this Mark I design has its nuclear fuel racks way up in the very top of the building. And it creates an earthquake problem and also a fire and terrorist hazard. And all of those can occur, as well, at Vermont Yankee. So exactly like Fukushima, Vermont Yankee is badly designed and has been vulnerable since day one. 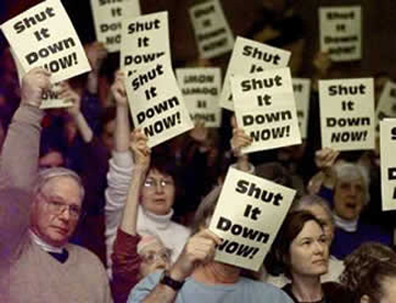 Despite all this, the Entergy Corporation, which “owns” Yankee Nuke, sued the State of Vermont on April 18, claiming the State government has no right to demand that the nuke be shut down. So much for State’s Rights versus corporations. Perhaps loss of political control by the American people has something to do with our ongoing national economic decline? You think? Maybe? 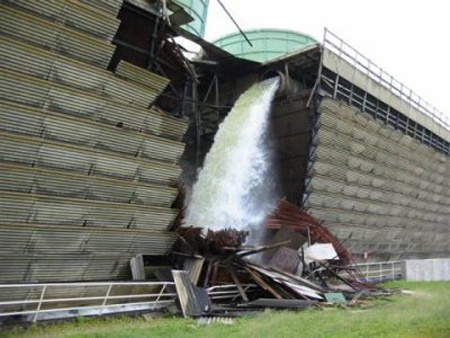 Four years ago in 2007 I wrote about the Vermont Yankee Nuke plant in Brattleboro, how their cooling towers collapsed because the Entergy Corporation was running the reactor at 120 percent of capacity. The collapse was revealed to the world by the last remaining union workers at the site. After this the Entergy Corporation cooled down Vermont Yankee Nuke to run at 50 percent capacity for a short while. To avoid further inquiries, you see. Perhaps the cooling tower collapse prevented a corporate induced meltdown of the reactor core. We’ll never know for sure. As far as I know, this blog was the only media entity in the Capital District to have reported the cooling tower collapse back in 2007. The censorship was stunning. Except for an exceedingly lame and deliberately uninformative Associated Press (AP) article that was mostly ignored, no newspapers or TV or radio outside of southern Vermont reported this story. No corporate owned internet sites reported it. In 2009 radioactive tritium was found by citizen monitors to be oozing out of Vermont Yankee Nuke into the ground water. In February 2010 tritium was found by the State of Vermont to be pouring into the Connecticut River. 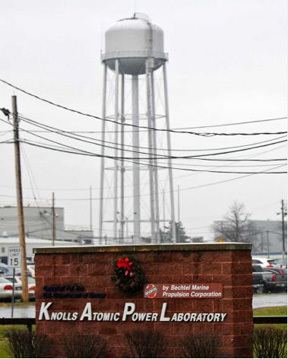 Since then deadly radioactive material has been discovered all around the plant, including January of this year leaking out of previously secret cracked groundwater pipes outside the plant. Vermont Yankee Nuke is obviously FUBAR. 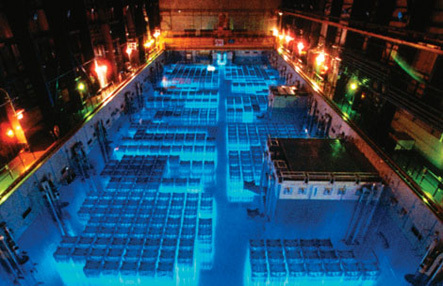 The reactor’s 35 year license expired in 2007. Time to shut it down and begin the long, slow, and very expensive clean up of the contaminated site. Any idiot can see that. So why is this nuke still operating and threatening lives? Once again common sense along with security, health. safety and democracy are completely forgotten so that our society can serve the bottom line of some corporation or other. The Entergy Corporation, which “owns” both Vermont Yankee Nuke and Indian Point Nuke, leveraged a lot of its own money to “buy” Vermont Yankee Nuke and it MUST get a return on its investment. That’s corporate socialism. So, like, aren’t there regulators or something, you know, people in the government who watch out for this sort of thing? And protect us from meltdowns? No. There is no one in Washington DC to protect us. On the contrary, the federal regulators want to harm us. Seriously. This past March 10 the Nuclear Regulatory Commission (NRC) gave the disintegrating forty year old Vermont Yankee Nuke a twenty year extension on it’s operating license. This despite the Vermont Legislature’s firm commitment to shutting down the time bomb by next year at the latest. If they can. The problem is that the NRC is packed with Nuclear Industry apparatchiks and cheerleaders, all tainted with massive conflict of interest. (Thanks Ronnie Reagan!) A careful reading of board member biographies reveals close associations with the leading nuclear corporations. But of course they do. In a secretive closed industry enjoying no competition, how could anyone associated with the industry not be tainted by corporate loyalties. I’ll reply, “You're equating patriotism to liberal thinking? Now you get it. The problem with corporations, in general. is that all they care about is The Bottom Line. They don’t care about America. All things must be shaped and manipulated to generate profit for the corporation. Things like health, safety security and democracy and the USA itself must be sacrificed if these things interfere with corporate profits. Of course Mr. Teabag Dittohead, an obedient corporatist, stopped listening at my first deviation from political correctness. We can look at Vermont Yankee Nuke and see the truth of what I’m saying. The only reason that the Enterty Corporation wants this disintigrating nuke kept open and operating is so that the Entergy Corporation can make a bigger profit from their investment. By the way, constitutional governments like our own are elected and our politicians can be held accountable if we want them to be. In contrast the Corporate Elite are not elected and cannot be held accountable except by application of violence. We can shake our fists at them, or we can do like the Liberal Patriots of Boston did late one night in 1774 in response to the growing power of the East India Company. They brewed corporate tea in Boston Harbor. We all know what that led to. And no, we don’t need the electricity from nukes. Demand for electricity nationwide has leveled off these past three years, partly because of the Bush Obama Recession and partly because of new energy saving technologies. In New York demand for electricity has been dropping, and unless our state magically develops a manufacturing base then demand will continue to fall. 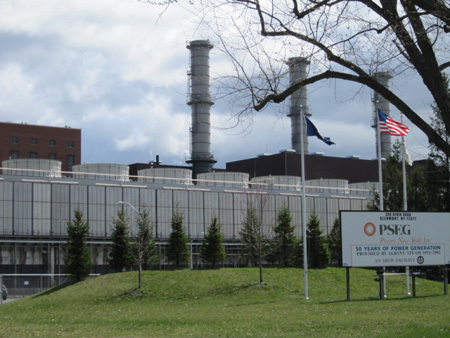 However, thanks to former New York State Governor Joe Bruno and his hand puppet George Pataki, we now have all these gas generated power plants, such as the one in Selkirk south of the Port of Albany. And as of last year the State is locked into a contract to purchase electricity generated 1700 miles away in Canada! We taxpayers don’t need Vermont Yankee or Indian Point or any other nuke plant. Some 20 percent of New York State’s electricity is generated by nuke plants, that is generally considered a big reason why our State has some of the highest electricity costs in the nation. Every time you pay your power bill a certain amount goes directly into the pocket of some elite nuclear executive, a privatized tax. Corporate Socialism is very expensive. Chernobyl in the Ukraine, which up until Fukushima was called The Worst Nuclear Disaster, is surrounded by a lousy inadequate 30 kilometer dead zone. 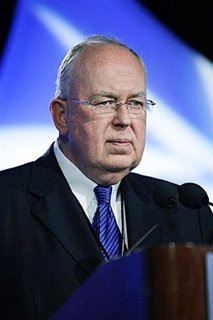 But according to the International Atomic Energy Agency (IAEA) the contamination zone around Chernobyl extends some 500 kilometers, or 310 miles. When Brattleboro goes Chernobyl, the effective contamination zone will stretch all the way past Rochester. You can forget about ever returning to Albany. Make no mistake about it, all the authorities involved have every reason to downplay and hide the impact of nuclear “accidents.” The size of these dead zones, the extent of contamination, even the numbers of dead and injured are minimized. As bad as all this sounds it is actually far worse. Reinhabiting the large dead zone around the [Chernobyl] accident site may have to wait longer than expected. Radioactive cesium isn't disappearing from the environment as quickly as predicted, according to new research... "Normally you'd say that every 30 years, it's half as bad as it was. But it's not," said Tim Jannick, nuclear scientist at Savannah River National Laboratory and a collaborator on the work. "It's going to be longer before they repopulate the area." You might think that after all the recent excitement in Japan that planning for the construction of new nuke plants in the USA is dead, but if you think that then you are mighty uninformed. Some of our biggest and most powerful politicians are currently working very hard to make us taxpayers subsidize these deadly dangerous money pits. Meanwhile guys like Congressman Gibson, who is not exactly the sharpest pencil in the book bag, is positioning himself so he can catch some of that taxpayer money as it falls from the sky. To put it simply, Gibson is offering himself as a spokesman for the nuke industry. Like all Republicans and most Democrats, Gibson doesn’t give a rat’s right buttock about the taxpaying voters that he is supposed to represent. Like most of his political colleagues, he sees us voters as a bunch of dumb yahoo cows that need to be milked for the boss. Except that it looks like Gibson is unemployed at present. Apparently he assumed office last year without a steady corporate sponsor, or maybe the ones he had were not big enough for his needs. In any case he wants to get in on this nuclear money thing before everybody else does. But so far it appears that the nuke corporations aren’t too interested in what Gibson has to offer. Gibson’s characteristic junior high school gym teacher bluster (“I want this done and I want it done safely”) might impress some suburbanites who watch a lot of daytime TV but not too many other people concerned with their own health. But that may soon change. I think the nuclear elite are waiting to see if he proves useful and effective as a spokesman against his constituents before they hire him. The mild irony here is that Gibson the Re-pub is positioning himself to catch falling cash while waiting for Democratic President Barack Obama to drop that deluge of nuke subsidies on his head, money he is certain will soon fall like rain. 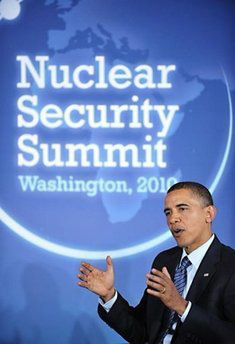 Obama’s cozy ties to the nuke industry, particularly the Exelon Corporation, go back to before he became a US senator. His home state of Illinois, you see, has more nuclear power plants than Sweden. Illinois has been made more than 50 percent dependent upon nuke plants for its power needs. The President has made no secret of his ongoing employment by the nuke corporations. Even after the details of the Fukushima nuclear disaster in Japan continue to leak past the corporate media filter, Obama has famously repeated his commitment to build 30 new nuke plants in the US, almost completely at taxpayer expense. Of course the ownership of Obama’s nuke plants and the profits derived from them will be private. But we get to pay for them. Our corporate socialist President has offered the nuke corporations some $36 Billion as “loan guarantees,” that is, to back up insurance policies. This on top of $18.5 Billion provided by the Re-pub Congress in 2005. Why? Because no bottom line worshipping insurance corporation has ever willingly agreed to underwrite any nuke plant in the US with their own money, not since the relatively minor “ nuclear accident” at Three Mile Island in 1979. Gee, maybe these insurance corporations know something about insurance? “Except with massive subsidies, there’s really nothing one can do to make a whole lot of nuclear plants economical right now.” That quote is from John Rowe, the CEO of the Exelon Corporation. Rowe (and his predecessor) was Barack Obama’s boss back when he was a Senator. That brings us to the horrible part about all of this. You see, a big military industry has grown up around the reuse of the radioactive waste cast off by the nuke industry. This “spent fuel” or denatured plutonium” is now used in a large range of tactical weapons and vehicle armor by our vast bloated military. For some reason mixing certain types of radioactive waste into shells makes them penetrate farther and deeper. As an added plus, when the shells explode they cover the area with a fine radioactive dust that remains deadly for thousands of years. That really beats the enemy, unless of course you plan to conquer and occupy the enemy’s territory. Then that radioactive dust becomes a permanent problem for the conquerers, but oh well. And for some reason adding nuclear waste to tank armor makes it incredibly invulnerable. It also makes tanks radioactive, but again oh well. The important thing is that recycling nuclear waste into weapons is now a big sector of the Military Industrial Complex. Some big corporations are making a lot of money off of this. It’s all about the benjamins, yo. A small amount of that deadly nuclear waste spewing forth from those nuke plants is now in demand. It’s commercially viable, worth quite a lot. There’s simply not enough “denatured plutonium” and other kinds of so-called “spent fuel.” The currently operating aging nuke power plants can’t keep up with the demand for waste, so there’s only one solution. We need more nuke plants to generate more valuable radioactive waste for the corporations. The President knows damn well that this country doesn’t need nuke plants to generate more electricity. Yet Obama wants 30 new nuclear power generating plants built in the USA so that they can provide more “spent fuel” that he can spread over Afghanistan. Or Iraq, Libya, Vermont, anywhere. To put it plainly, nuclear power generators have become manufacturing plants, factories that make deadly substances used to make war. As strange as it sounds, producing electricity for domestic consumption is now secondary. If a nuke plant in nearby Easton doesn’t eventually kill us all here in Albany, then the reactor will be used to routinely kill other people all over the world. And the deadly substances that will be made by the factory in Easton will continue to kill long after America’s pointless corporate wars are forgotten. The only presidential campaign promise from 2008 that Obama has kept has been to heavily fund basic solar cell research. In 1981 Ronnie Reagan dramatically stopped federally funded research into the next generation of solar cells, one of his first acts upon capturing the White House. None of his successors reversed Reagan’s anti-solar policy. Reagan thus condemned America to dependency on foreign oil and initiated the economic decline that we are struggling with today. But to his credit, last year President Obama funded some eight major research projects into developing solar cells. Several of these projects are very, very promising. This year our corporate socialist president has funded even more research projects, including a $57.5 million grant awarded to the University at Albany’s College of Nanoscale Engineering earlier this month. 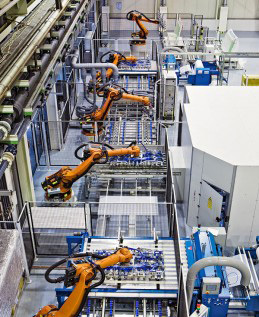 No doubt the new technology behind this new generation of solar cells will be given to big corporations. But once a variety of cheap and plentiful solar technologies go public, no one will need to put gas in their car or pay power bills. All us regular folks will ever have to do is use our homes and even our persons to collect enough free power to last all day. No more dependency on power corporations or power grids. That’s the future we all want. And that’s the puzzling irony. Barack Obama, the best friend that predatory corporations have ever had, is quietly taking the basic steps that will eventually destroy those corporations that currently control energy. But meanwhile, before that happens, Barack Obama and Chris Gibson want to kill a lot of people with radiation and make a buck. Thanks guys. I'm fascinated by the pro-nuke movement. You would havce thought that the Japanese disaster would have put at least a crimp in it, but no. Got into a bit of a debate with someone online over this. the partyt line is that the anti-nuke folks are "silly" and "unrealistic", that we HAVE to have nukes because we cannot be dependent on foreign oil. We'll end up using less energy eventually, because we just HAVE TO. 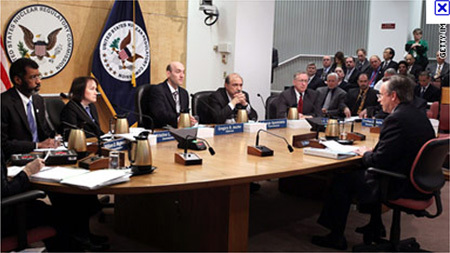 Limited liability is itself a type of government subsidy. Why don't the tea partiers realize that? So, if shareholders are made liable or at least partially liable for the success of their investments, would that encourage "corporate responsibility?" Or would that simply direct investments toward monopolies which have no risk? Beware the quick fix, which can be easily perverted.